The Six Nations Snipers. Photo courtesy of the ALL Women's Division. 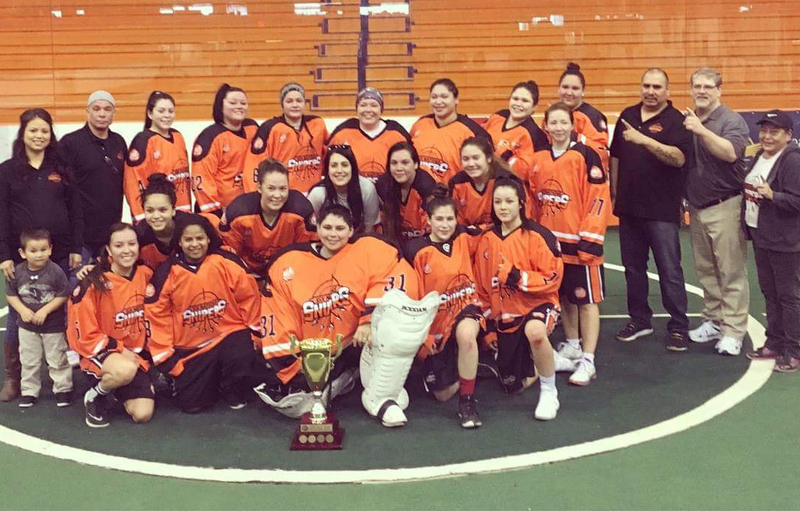 Wade Thompson is hoping the day will come that a women’s professional box lacrosse league exists in Canada. For now though, Thompson is doing his best to promote the women’s division of the Arena Lacrosse League (ALL). This four-team division stages all of its games out of the Iroquois Lacrosse Arena (ILA), located in Hagersville, Ont. on the outskirts of the Six Nations community of Ohsweken. The ALL, which does not pay any of its players, started off as a men’s winter league in 2017. The third-year league now features seven clubs, all in southern Ontario. The ALL added a three-team women’s division a year ago. A fourth women’s squad has joined for 2019. Thompson is once again serving as the commissioner of the ALL women’s division this year. Perhaps even more importantly, however, is that National Lacrosse League (NLL) representatives are familiar with the ALL now. This past November the Ontario loop was given a huge credibility boost as it reached a formal working partnership with the NLL, the North American professional box lacrosse circuit that features the world’s top players. ALL representatives are hoping to not only develop players but coaches and officials, as well in their league in the hopes they eventually move on to the NLL. Several players that toiled in the ALL are on NLL rosters now. And NLL officials are aware the ALL also features a women’s category. Thompson believes the day might come that the NLL decides to get on board and assist a women’s pro league in Canada. There are already a pair of women’s pro field lacrosse leagues south of the border. The United Women’s Lacrosse League has been around since 2016 and the Women’s Professional Lacrosse League had its first season in 2018. Those leagues were spawned in part because of the popularity of the American-based men’s pro circuit, Major League Lacrosse. Meanwhile, the Six Nations Snipers captured the inaugural ALL women’s title. The women’s league last year also included the Paris RiverWolves and St. Catharines Shockwave. All three squads were named after their male ALL counterparts. As for this year, the other team added was the Steelhawks, which has taken on the same moniker as the ALL’s Whitby Steelhawks. But the women’s clubs this season are only going by their team name. “As a group we elected to drop the city names,” Thompson said. This was a logical decision, especially considering all four women’s teams play all of their contests at the ILA. All clubs will play a 12-game regular season schedule. Teams will play two matches each on a Saturday six times. And most of the participants in the ALL female division also toil in the summertime Ontario Women’s Box Lacrosse League. Squads kicked off their 2019 ALL campaign with games on Jan. 5. The next league contests are set for Feb. 9. A total of 85 players signed up to take part this year. To create as much parity as possible, all four coaches in the league converged following a one-day pre-season tournament in December to do their best at balancing the rosters in the league. Thompson’s step-daughter Alisha Smith, a Mohawk (Turtle Clan) who lives on Six Nations, believes the ALL women’s division will continue to grow. “As long as we keep raising awareness about women’s box lacrosse it will just keep getting better and better,” said Smith, a 32-year-old who is toiling for the Shockwaves now. The ALL is for those aged 18 and over. A number of younger individuals were allowed to sign up with parental consent. The oldest player in the division this season is 51. Smith added she has no problem with the fact the ALL women’s division is a Saturday-only affair. The men’s division of the ALL this season features seven entrants, including the Six Nations Snipers. Other participating squads are the defending league champion Whitby Steelhawks, Oshawa Outlaws, Peterborough Timbermen, Toronto Monarchs, Paris RiverWolves and St. Catharines Shockwave. The league is also operating three youth divisions. They are for those in the Under 13, Under 16 and Under 22 groupings.